This stage is to produce a larger sample based on one of the samples done in stage 3, either making an extended version of a repeating pattern or making a ‘single unit’ piece. I chose to use my linocut to make an extended version of a repeating pattern. 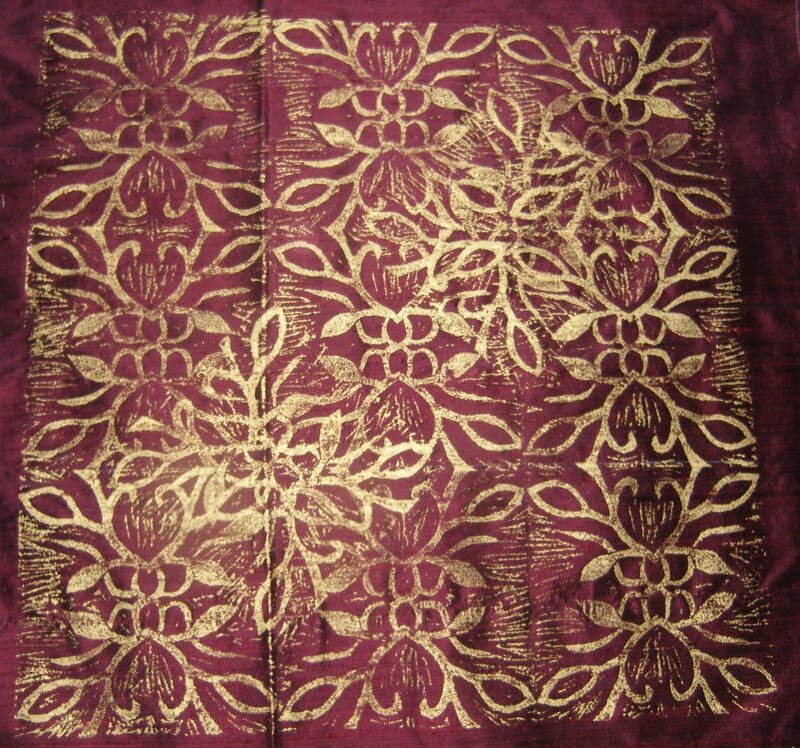 I selected a silk dupion fabric in a deep burgundy colour, it has such wonderful texture to it. 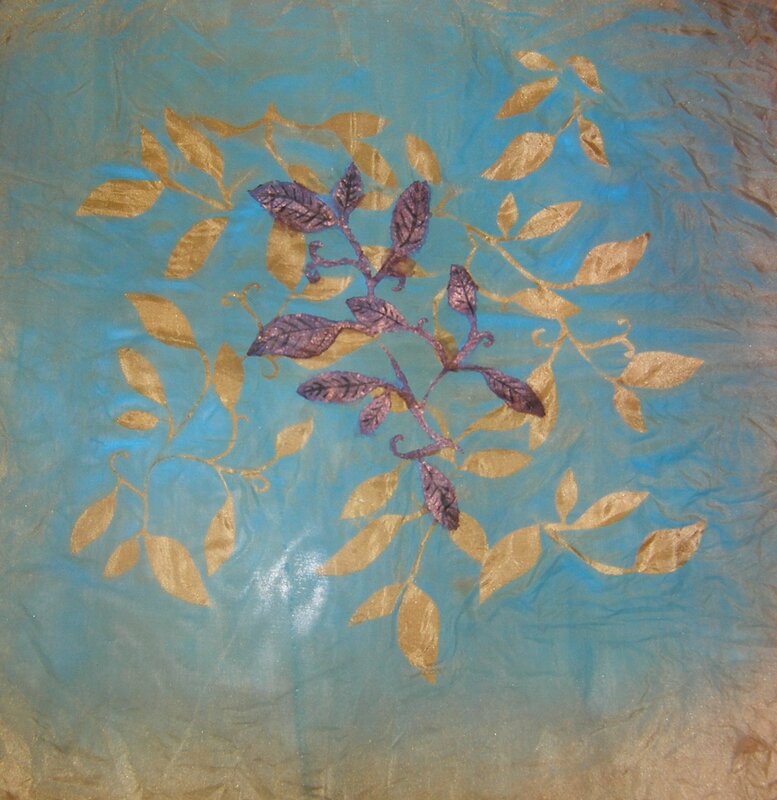 To match the rich colour I used gold fabric paint. I measured squares the size of my lino on the fabric so I could get the positioning right and have straight lines. After printing the 9 base blocks, I added 2 extras at angles to add extra depth and movement. The course says to try the alternative as well, to make a single unit piece. For this I chose the leaf stencil. I started with a green silk fabric, cut out lots of leaf shapes and positioned these using spray mount. I airbrushed over this with a light wash of blue paint, colouring the negative areas. Then I used my stencil to sponge paint into the positive shape in purple and then copper. Finally I added leaf veining with a paintbrush and black paint. I had more of a play and decided to make a 3rd sample! This uses the petal design. I screen printed the design onto 2 pieces of grey felt, using red, yellow and white paint unevenly in the screen to achieve different colour effects. Then I cut out the shapes and placed them on a piece of cotton fabric that I airbrushed in different shades of blue and purple. 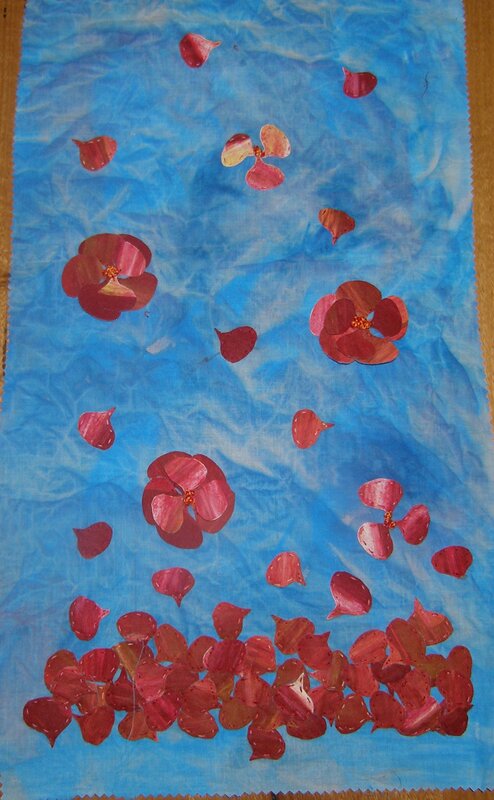 I wanted an effect of petals tumbling down so I space out a few at the top and then had them bunching up at the bottom. These were stitched on with running stitch. I also added a 3d effect by creating flowers with 5 petals as a base layer and 3 on top, stitching these in the middle only so the flowers were raised. I finished this with French knots in the centre of the flowers.